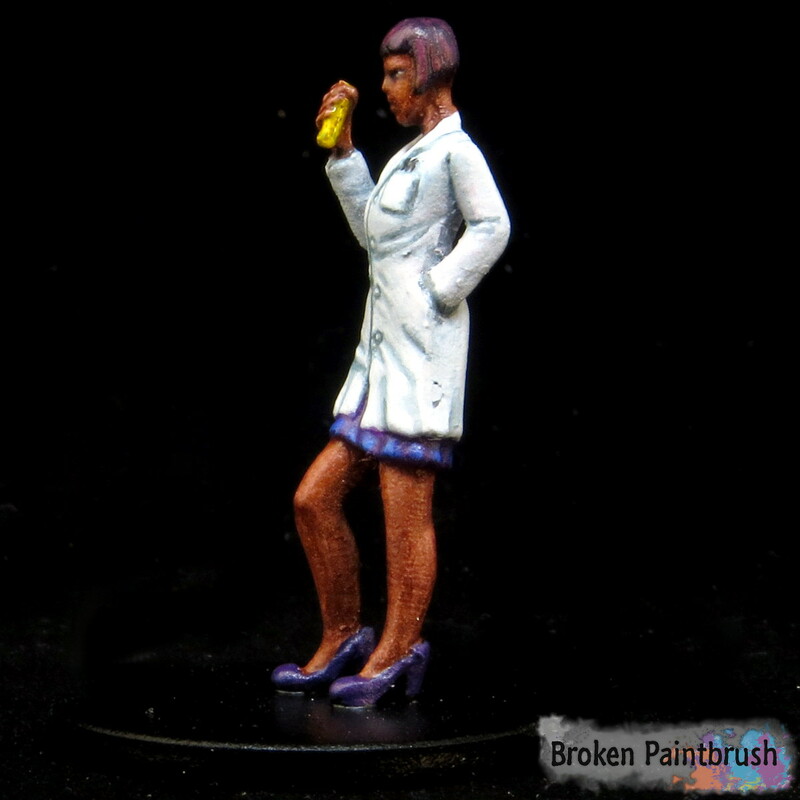 I’m back with another Mansions of Madness painting tutorial, this week with Kate Winthrop. Kate is a supporting investigator, the scientist who makes uncovering clues and solving puzzles much faster for the investigator team. 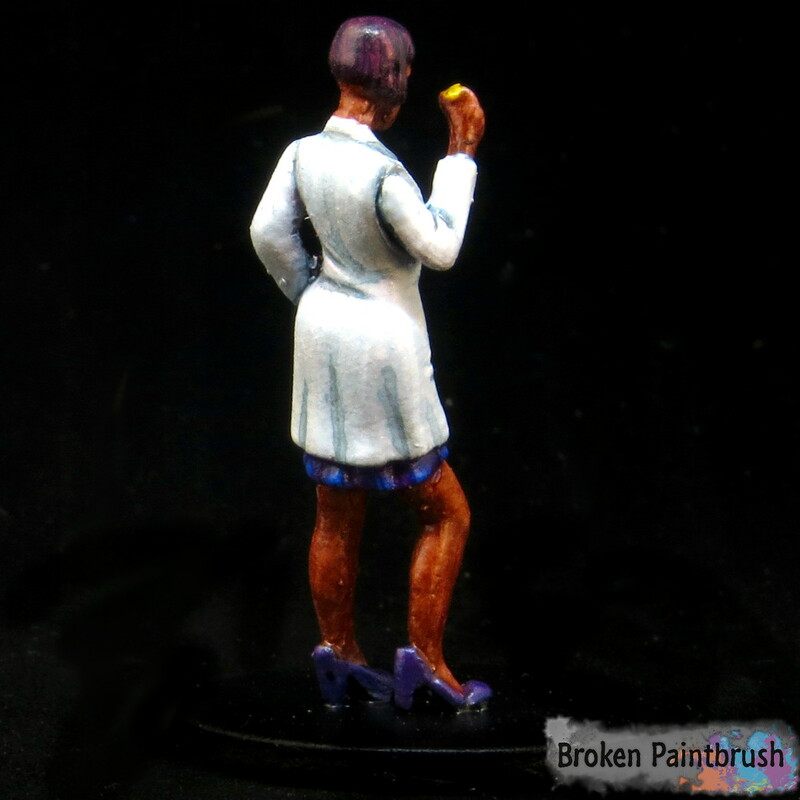 As I’ve been exploring different skin tone options as well as wanting a diversified investigator team, I decided to paint Kate with a dark skin tone. I also explore some of the shaded basecoat technique where you paint a few layers of highlights before washing it back down. So the model was prepped by removing the grotesque number of mold lines and attempted to fill in a few seems. She was then primed with white primer spray and let dry. The main color sections were blocked out. This allows me to get a sense of how she will look in the end and rebalance colors if needed. The skin started with the dark Mahagony brown, the dress a nice deep purple, and of course the lab coat with an off-white base. The next step was to paint up the skin tones. As I mentioned above, I am working on the shaded basecoat style made famous by James Wappel. So the base color of skin was highlighted twice. First with Parasite Brown followed up with Brown Rose. You’ll notice that it got fairly pale and wasn’t super smooth. The appeal of the shaded basecoat is that you can paint quickly with light colors and tone it back down with a few washes. So that’s what I did here with a wash of thined down Dark Fleshtone. You can see it brought the skin to a much darker brown tone and blended the colors back together. Areas between her fingers, hairline, back of her knees, etc. were washed with an additional layer with a bit more black added it. 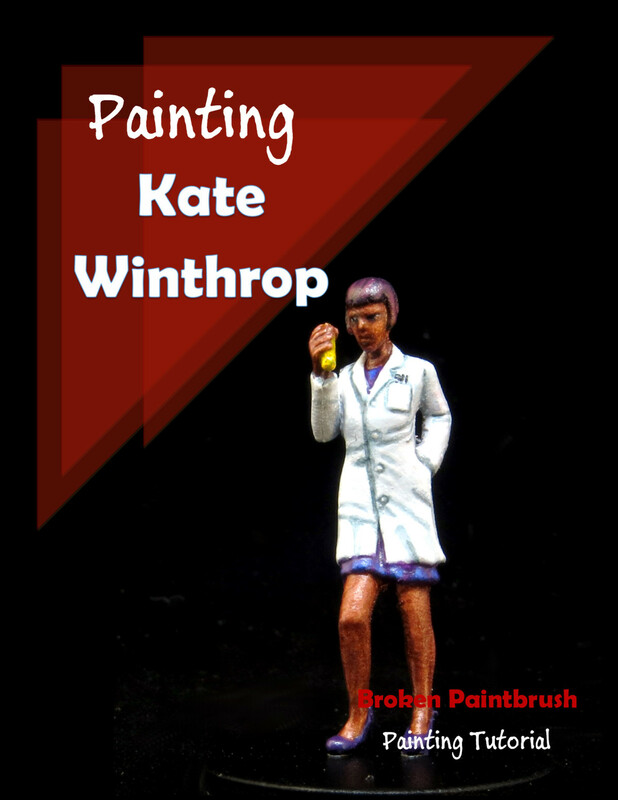 As a scientist, Kate Winthrop needs a white lab coat of course! The trick to painting white is to not actually use pure white until the top most layer. Instead, her coat was based with Wolf Grey, a slightly blue-grey white. The folds, creases, and edges were washed with Blue Grey to add extra emphasis to them. A few areas where re-touched with a bit of black added to the mix to make them stand out even more. Finally, a layer of pure-white was added to the top edges to highlight. By starting with the slightly off-white, the highlight was actually able to stand out and work. 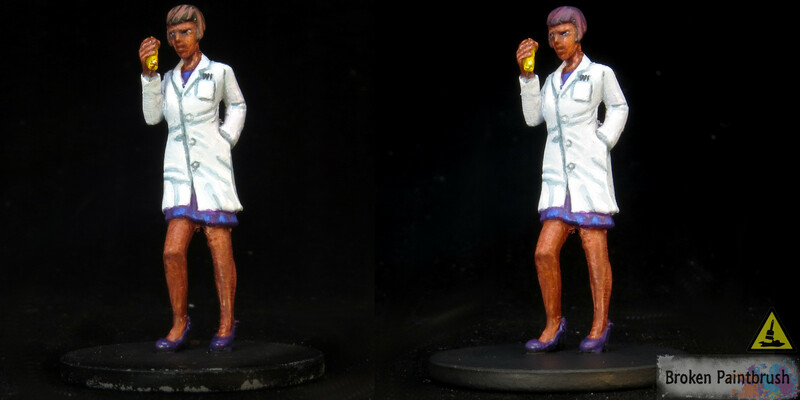 To add a bit of color to Kate, I made the dress under her lab coat purple. It started off much like Jenny Barnes’ blue dress with a base coat of Hexed Lichen and highlight of Ultramarine and Electric Blue. To bring it back to purple, I added a wash of Hexed LIchen with Glaze Medium. A scientist crazy enough to explore creepy old mansions would probably be on the hip side. So rather than giving her a basic brown hair and black shoes, They both went purple as well. I first started with a highlight of Mahagony Brown for the hair to give it some variation and base coating the shoes with Royal Purple. Both were then washed with Hexed Lichen to add the purple hue. I hope you enjoyed the painting tutorial for Kate Winthrop, especially my attempts at the shaded basecoat for her skin and dress.